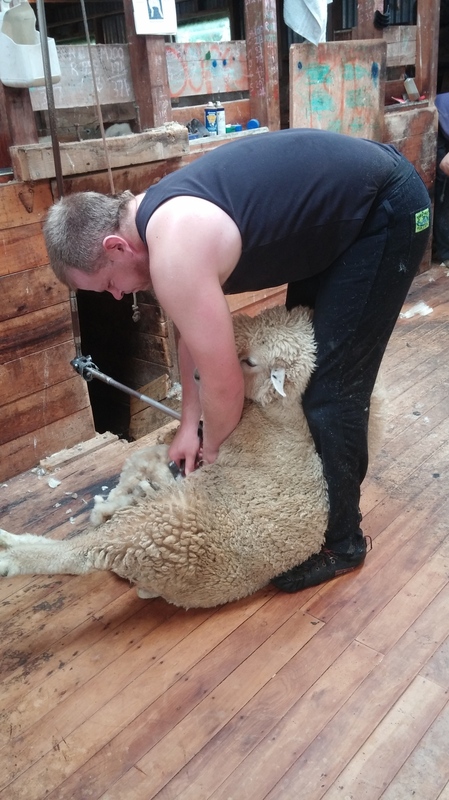 Sheep Shearing in New Zealand: Ewe Need a Haircut? Surprisingly, our sheep farming days weren't entirely over yet! We had missed an opportunity to shear sheep and be shed hands during our first go 'round in Invercargill, New Zealand when we were captured at the launderette. 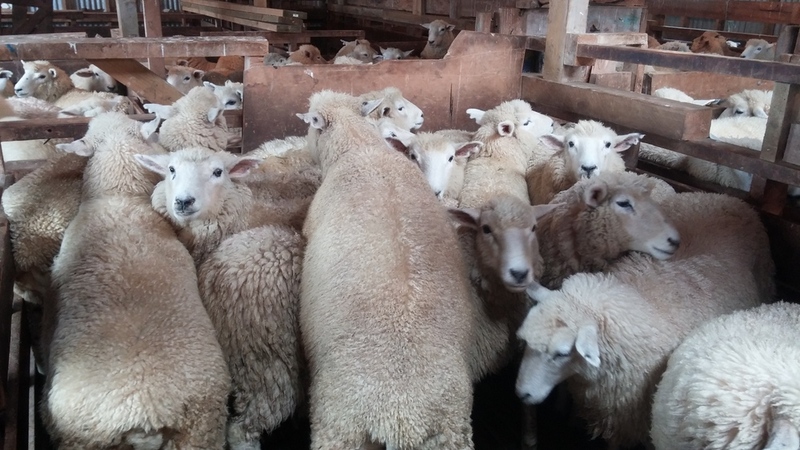 So, we jumped at the invitation to be shed hands during a shearing at Gay and Ron's farm, Manuka Mire. Once we received her text, away we flew to Invercargill to get our hands in that wool again! As we were making our way to the farm riding down the familiar country roads we both looked at each other. It hit us at the same time. An overwhelming sense of comfort had over taken us. Warm and fuzzy memories of wooly ewes, overalls, gum boots, green paddocks, home made jelly and mince pies all started flooding back. We were pumped to be heading to the farm again! Fulfilling our role as shed hands was quite an adventure. Can't say we have helped give a sheep a hair cut before! We were all smiles all day (probably from Gay's wonderful hospitality of keeping us loaded on hot tea and delicious biscuits)! The ewes ready to go in the wee morning hours. Robbie and Matt prepping their shearing gear in the wool shed. Callie the sheep dog is ready to go, too! 7:20 am start right on time. Not a second late! Squished and ready for their hair cuts! These two aren't so excited and are eager to escape their naked fate. Adam and I both had our fair share of tackling some of the ewes to keep them inline. Robbie working the belly wool. We were the shed hands. Sweeping up the wool as it was sheared off the sheep. Working hard, the guys sheared over 350 sheep and did each one in less than three minutes! Two minute break! These shearers are strict on time. Still loving this #nuventures! These girls are the after-lunch crew. Lovely wool ready for the press! Ron, the farmer, shoving the wool into the press. Got 5 bails of wool from the shearing! Now the girls are naked. Ladies, modesty, please! Rounding 'em up to go into a new paddock. Our new wheels for the day! So pumped to be back on the farm! Gay leading us through her farm she calls Manuka Mire. Pit stop rounding up some strays. Gay showing us the lookout they built to see all the ducks in their lake. Of course can't leave out these girls. The curious cows on Manuka Mire. Loved being a part of Manuka Mire's shearing! Who knows, maybe more sheep to come in our future:) Now on to some Fiordland nuventures! Hey there! We're Lindsey and Adam Nubern. We've been traveling the world full-time since 2014 and have built businesses along the way. Get our news and updates of travel tips, lessons learned, and adventure stories by subscribing with your email below.